Iran abandoned its nuclear weapons program in 2003, according to U.S. intelligence agencies, but Washington says it remains ready to revive the effort. WASHINGTON — The Trump administration unveiled new sanctions against Iran on Friday targeting nuclear scientists and companies that it says were linked to the country's former nuclear weapons program. The Treasury and State departments said the U.S. had blacklisted 31 Iranian nationals and organizations that allegedly supported or were associated with Iran's past efforts at building nuclear weapons. "With this action, we are exposing those people, those entities and making them radioactive internationally," a senior administration official, who spoke on condition of anonymity, told reporters. The Iranians and companies designated were all linked to Iran's Organization of Defensive Innovation and Research, known in Farsi under the acronym SPND, which was founded by Mohsen Fakhrizadeh, the mastermind of the regime's former nuclear weapons program, the State Department said in a statement. "Anyone who continues with SPND risks professional, personal and financial international isolation," the official said. The individuals named will face difficulty traveling abroad, attending academic conferences or finding work elsewhere, the official said. Iran abandoned its nuclear weapons work in 2003, U.S. officials said, but it has kept the scientists and staff who worked on the project together, and they continue to conduct research that could be used potentially for future work on an atomic bomb, officials said. By retaining the nuclear team, Iran intended to "to keep their skills sharp" in case Tehran decided to revive the weapons project, said a second administration official, who was not authorized to speak on the record. "This was a way to keep the gang together as it were, and to provide a reconstitution capability for that weapons program for the Iranian regime should it choose to use that," the second official said. The blacklisted individuals and companies have conducted research on pulse power, wave generation, particle accelerators, missile technology and explosive experiments relevant to the development to a nuclear weapon, officials said. 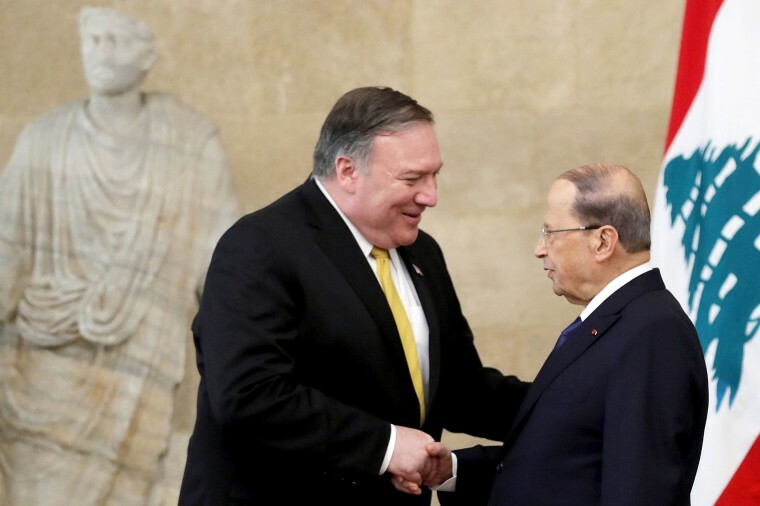 The move coincided with a Mideast trip by Secretary of State Mike Pompeo, who during a visit to Beirut on Friday called on Lebanon to reject the influence of the Iranian-backed Hezbollah movement. Behnam Ben Taleblu of the Foundation for Defense of Democracies, a think tank that has supported tough sanctions on Tehran, said the measures offered a way to undercut any attempt by Iran to resume a drive to develop nuclear weapons. "Punishing those who have supported Iran's past illicit nuclear drive is another way for the administration to offset Iranian hedging efforts should the regime return to a full-court press for the bomb," he said. But a former U.S. official who served during the Obama administration said Washington's unilateral withdrawal from a nuclear agreement between Iran and world powers could end up pushing Tehran to return its nuclear weapons effort, and that the sanctions were unusual by focusing on past behavior and not current actions. SPND was first sanctioned by the United States in August 2014, before Iran signed a nuclear accord with the United States and other governments in 2015. The nuclear deal imposed strict limits on Iran's nuclear program, which it continues to adhere to, in return for a relaxation of international and U.S. economic sanctions. President Donald Trump withdrew the United States out of the agreement last year and reimposed an array of U.S. economic sanctions, including on Iranian oil exports. The sanctions block any assets held in the United States of those blacklisted but also apply to foreign firms or individuals who try to do business with them. "The United States strongly condemns Iran's efforts to maintain its band of former nuclear weapons researchers, preserve their work, and continue sensitive procurement activities," the State Department said. "Other Iranian individuals who work for the regime's nuclear program should know they risk being sanctioned by the United States." Since Trump entered office, his administration has imposed sanctions on 960 Iranian individuals, entities, aircraft and vessels, officials said. Dan De Luce is a reporter for the NBC News Investigative Unit.